Out of the box, the S2000 has amazing handling characteristics. As the suspension is further modified to improve grip, the increased g-forces sloshes the oil to the opposite direction of your turn, leading to oil pump cavitation > oil starvation > starved main and rod bearings > to a spun bearing and/or thrown rod. 1) Effective - Prevents oil pump cavitation under long distance, high g turn simulations. Oil drain back provisions were considered and inherent in our design. 2) High Quality - U.S. High Grade Aluminum & Precision Cut Baffles. 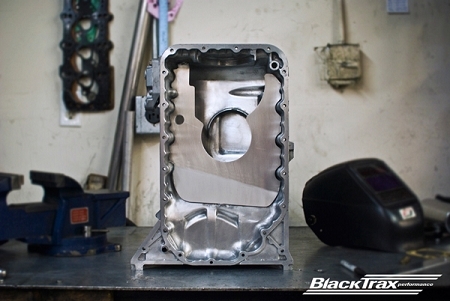 In-house hand TIG welded to Brand New OEM Honda oil pans, guaranteed will not crack. 3) Price Point - We considered your cost vs. benefit on this pan and we're adding a Lifetime Warranty on top. 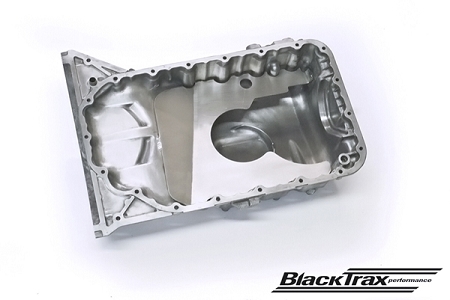 Limited Lifetime Manufacturers Warranty: BlackTrax Performance will replace any BlackTrax Baffled Oil Pan Kit that show signs of cracked welds or manufacturer defect with proof of purchase. After inspection, pans and/or baffles showing signs of being scraped, dented, bent, hammered, bottomed out or drilled, VOIDS WARRANTY.